Are you looking for a showstopper of a decorating piece? 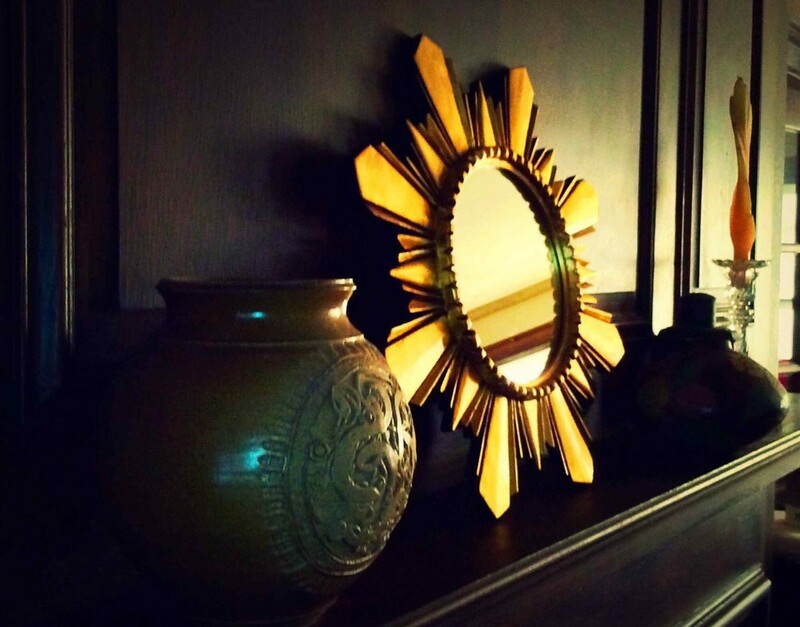 NOVICA’s ‘Cuzco Sun’ Bronze Leaf Round Starburst Wall Mirror is your shining answer. This gorgeous 18” mirror comes from Peru and is made of Mohena Wood, a Peruvian hardwood, and is intricately covered in bronze leaf. One of the things I love about this mirror is that the bronze leaf is a definite bronze color with indirect natural daylight, but takes on the most beautiful gold color at sunset, just as the sun does itself. The artist has truly made a study of light! 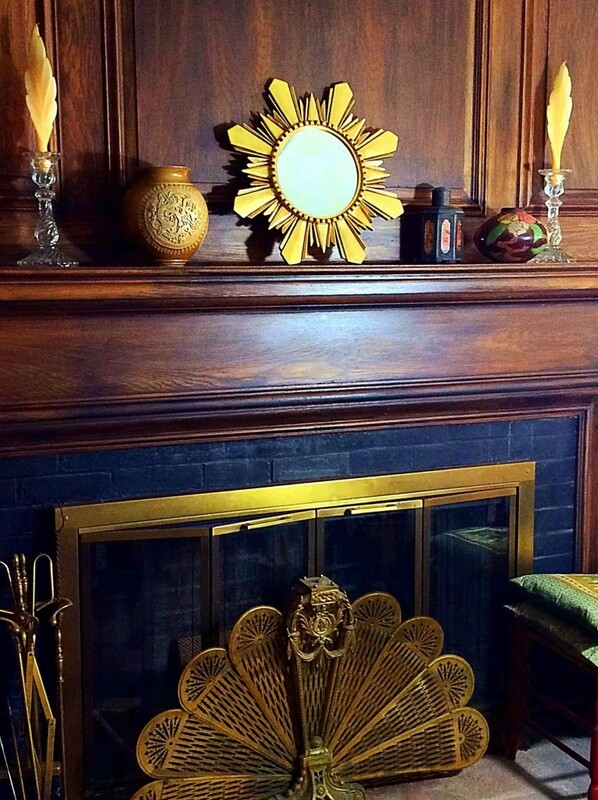 I chose to put it on the mantle above the Living Room fireplace as we have other bronze items around the fire and because the vibrant color of the piece is so striking against the dark wood. The mirror would look good against any background, but I think the depth of the detail especially lends itself towards a darker, richer wood background. It was a bit of a toss up for me between the Living Room and the smaller Dining Room fireplace mantle, but the grain of the wood in the Living Room and the grain of the Mohena Wood looked sharper to me. The mirror itself is 7.8” but appears larger. It is an exceptionally true mirror and shines vividly. If you are looking for a central vanity mirror you might want to look for a piece that has a larger mirror, however the reflection is excellent and stands by itself as a good mirror apart from the incredible craftsmanship of the frame. It’s worth a few words as to the sizing of this mirror. This is considered the Medium Size of the design at 18”. However, the depth and striking appearance of the mirror draws the eye far more than a larger and less detailed mirror would. 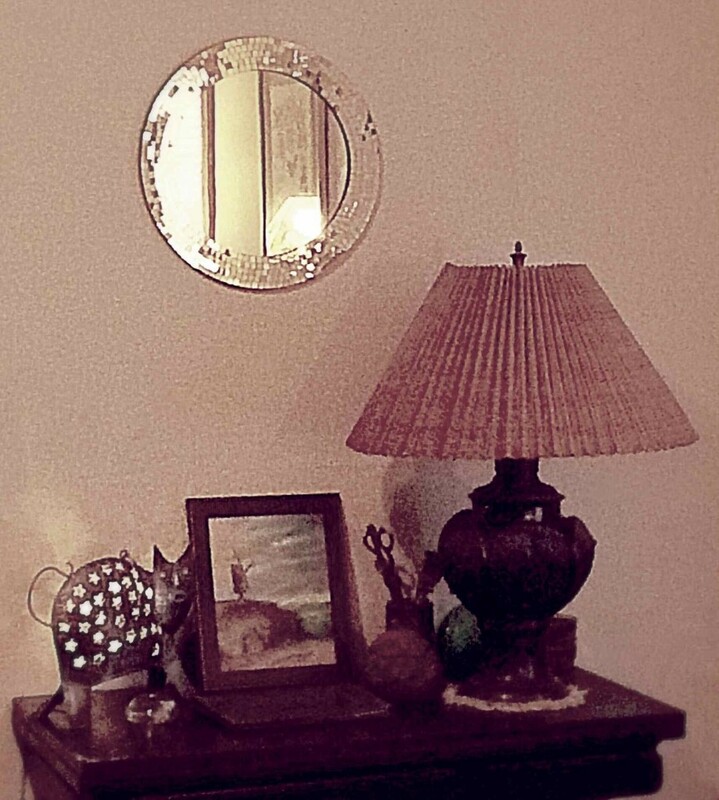 So if you want to place the mirror as a centerpiece among other items, the Medium is the right size. If you want a stand alone large piece for a wall, then you might consider the larger version. But truly do not underestimate the impact of this mirror. As with all decorative pieces, think about the impact more than the specific size. The piece was made by Jose Marcos Luzalde Rosales, who taught himself his craft starting at 17 in his neighbor’s workshop. At the ripe age of 18 he decided to go out on his own and became known (with good reason, as you can see) for his incredible work. He has delighted in preserving Peruvian Woodwork Artistry for 35 years now, and thanks to NOVICA, we can delight in his work as well! I absolutely adore this mirror. 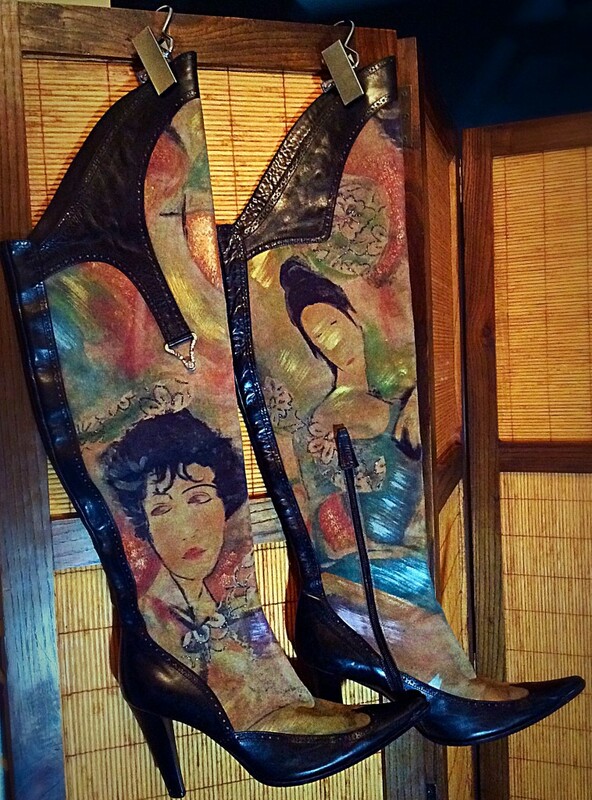 It adds light and depth to the room and has drawn gasps from anyone who has seen it. Find this incredible piece at Amazon.com. I received this item at a discount for review purposes. If you have any questions about the mirror, leave me a comment below! 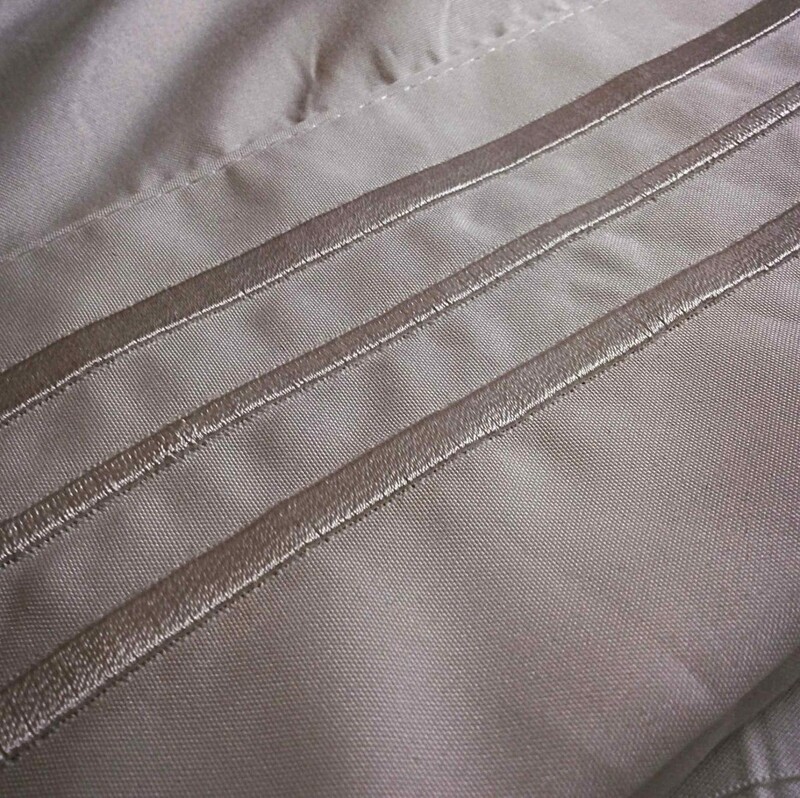 OVERVIEW: Nicely stitched, SO SOFT, no pilling, shrinking or fraying after washing, hypoallergenic. Fits well on a thicker mattress. They compare to high-end expensive sheet sets. Definitely worth it, Amazon has these at a great price. These sheets are a great deal. Having a high-thread count quality set of sheets is something I wanted after staying at a higher-end Omni Hotel that that had these beautiful monogrammed, high-thread count sheets. I bought two sets of 1200 thread count that had a retail of $350 and $400. While it was expensive and seemed like way too money to invest in a non-essential item, they are SO comfortable and have lasted me for years. It feels extravagant, but they are so helpful in getting a good nights’ sleep. So I was pretty happy to see 1800 thread count sheets available for such a good price. These are a great quality set and are SO SOFT. They are also more comfortable to sleep on than my more expensive sheet sets. I got these in white to match my summer bedding, so I am glad to see they are stain resistant because I like to finish my morning coffee in bed while reading the news and email. Something else I like is that they are hypoallergenic, which is especially nice in a pillowcase, I notice my eyes seem slightly less puffy in the morning than they do with some other sheet sets I own. The seams are not scratchy or lumpy feeling. The stitching is well done and there are no loose strings after washing. These are reasonably deep fitting, but if you have a very fluffy pillow-top mattress exceeding 15″ or so you might want to size up if possible. I have mine on a thick foam mattress with a foam topper and they fit fine. 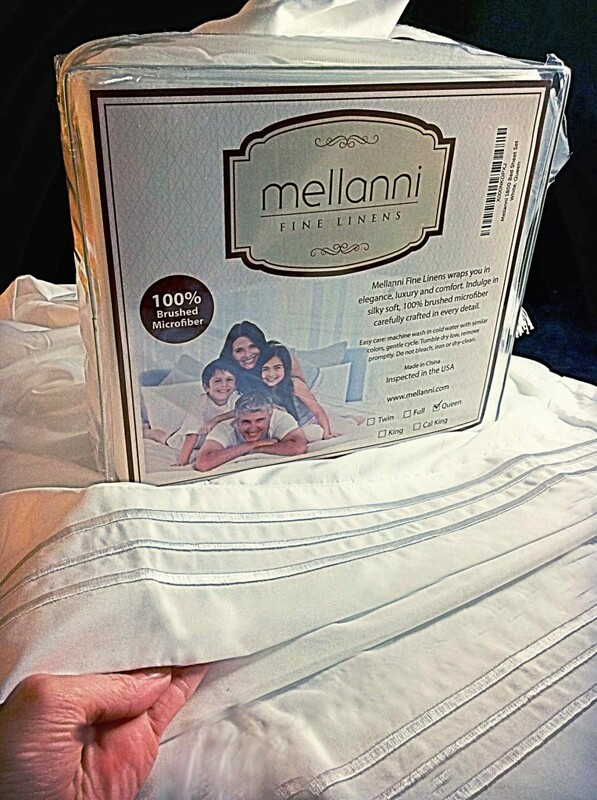 This does not really matter to me, but I didn’t really consider these sheets to be particularly wrinkle-resistant unless they mean that they do not hold the crease from being folded. I can’t feel the wrinkles when I am sleeping on them and they do not leave indent marks on my face when I sleep on them (I am a side sleeper). 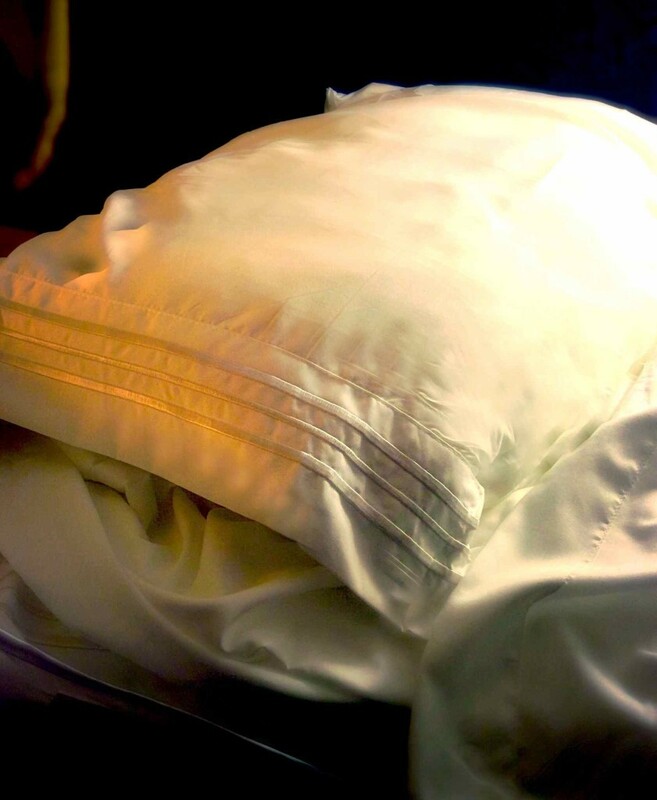 One thing I particularly like about well-made sheets is that they don’t feel too heavy during the summer but still give some warmth in the winter. They come in several pretty colors, I am tempted to pick up another set at this price. Good value, very soft and comfortable. Ensuring quality sleep is a worthwhile investment in my book. I received these sheets for testing and review purposes. If you have any questions about the product, leave a comment below and I’ll get back to you! It is Tea Tuesday here at StyleChicks. I am a big tea fan, and always love to try new flavors and brands. I also find that tea is pretty popular and can often make a nice gift for either gender. I especially like when a tea gift can be combined with something else the gift recipient might love, such as music, literature, or art. So I was excited to see the themed series “Collect Teables” from The Tea Book. April’s theme is perfect for a tea loving bibliophile and makes a nice housewarming gift or for other occasions that your pithy bookworm friends would enjoy as a tasty treat while reading their favorite books. This line of “CollectTeables” teas are styled and named after famous literary authors, playing on alliterations of their pen names or actual names to entitle their teas. Each bag comes with illustrations of the author and a nod towards thematic elements from their most famous works depicted on Artistically Drawn Foils. And, for the especially clever, hidden references to their works are also seen in the images. Can you find them in the photo below? 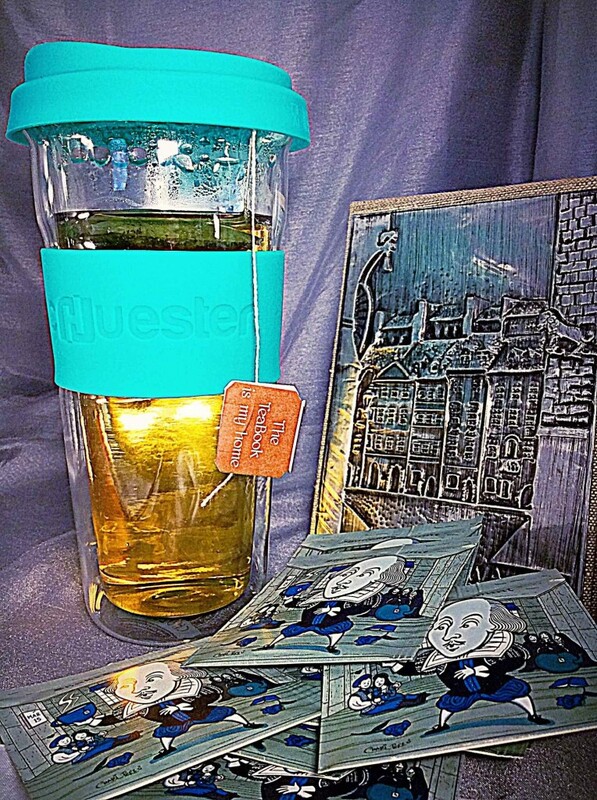 I tried the two currently featured authors: AgathaChrisTEA and William ShakeSpearmint (see what they did there?) The beloved crime novel writer Agatha Christie/ChrisTEA is Earl Grey, and Shakespeare/ShakeSPEARMINT is, of course, a mint tea. Every month a new themed series of Collect Teables will be released. They will include musicians, philosophers, politicians, or animals. • “The TeaBook and Collect Teables are zero waste companies. All Collect Teables are shipped box-less to reduce waste in shipping and packaging.” (quoted from the Tea Book website). • All Collect Teables teas are Certified Organic by OCTO, and Certified Kosher by KSA. 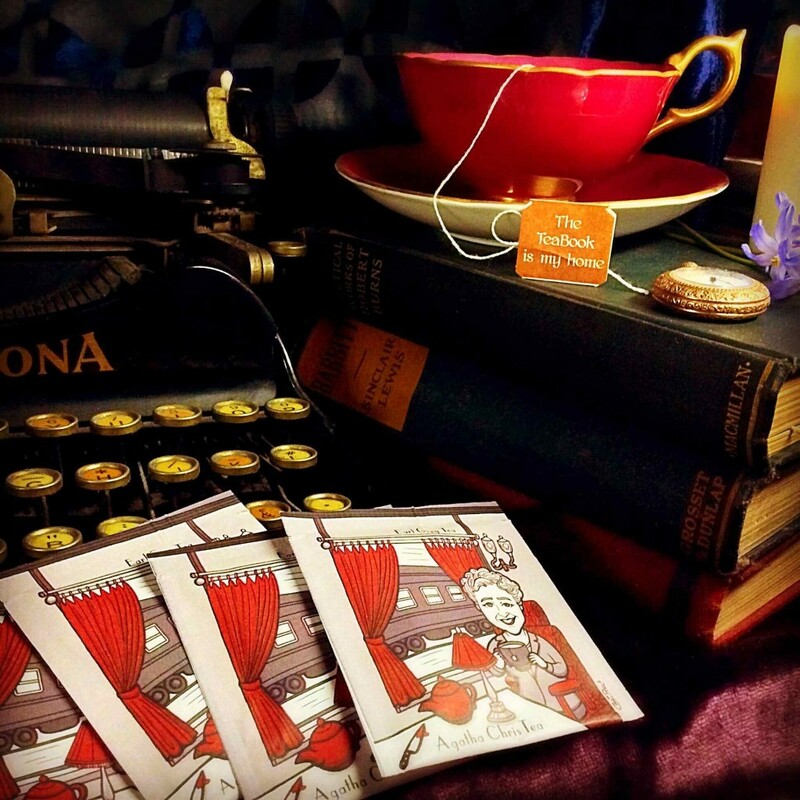 I tried out both and think the Agatha Chris TEA makes for a fun inclusion to serve at a book party or mystery dinner themed night, they can help make for an easy decorating theme and conversation piece, as seen in the photo below. Find these lovely teas at http://www.collectteables.com. I received this item in exchange for my unbiased review. If you have any questions about my experience with it, leave it in the comments section below and I’ll do my best to answer it! 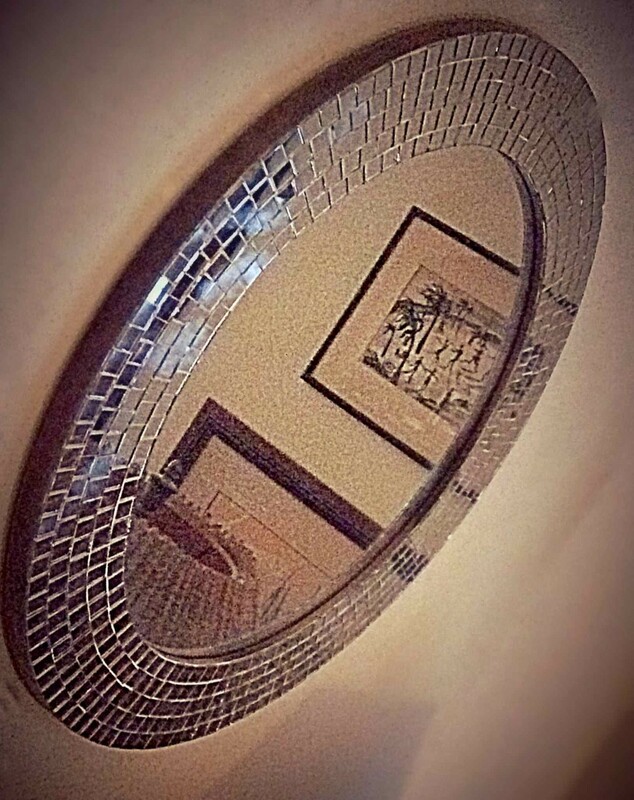 This is a very versatile mirror for home, office or gift giving. I like a larger statement piece type mirror that has some character without completely stealing the show from adjacent pieces. What I especially like about this piece is the five-rows deep of small mirror tiles on the perimeter border which pick up the colors and lighting within the room, so matches any décor, color, and lighting scheme. It says “silvery glamour” in the title, but if your color scheme does not match with silver, don’t shy away from this mirror because the mirror tiles are not matte silver-tone tiles on the border, they are actual mirrors. This mirror is great for an office, a guest bath, grouped with other frames and mirrors in a display, placed in a small breezeway or hallway, an entrance way, a bedroom, etc. The reflection in the mirror itself is true and accurate. 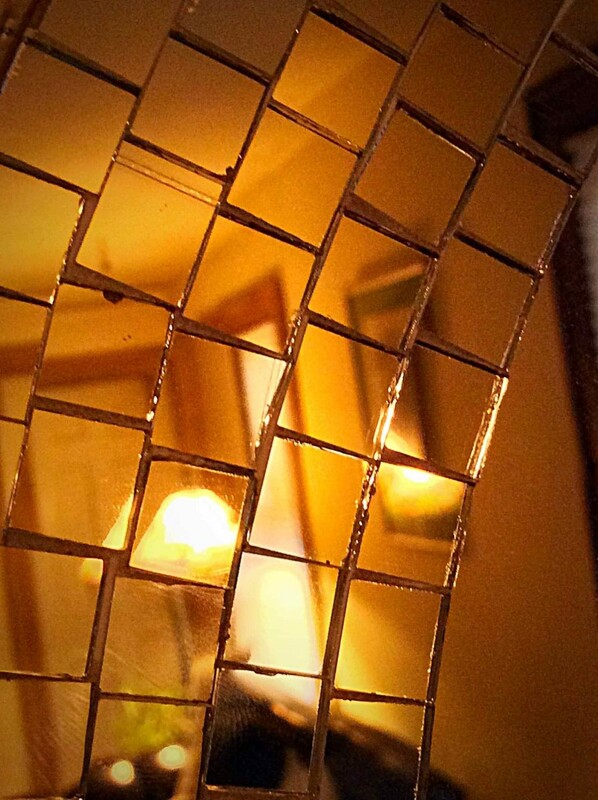 The border mirror tiles have a handmade look to their individual cut as they are not entirely even in placement, but they are not cracked or damaged tiles, more of an artistically uneven than done with factory-assembled row precision. I like this because of how it causes the light to reflect and refract and gives the reflection a softer, glowing look, and gives it a truly handmade look. I really liked when I placed candles and other lighting sources in front of the mirror and it cast a nice glow in the room. It also caught the light nicely from a stained glass lamp. I would imagine the style would also work in a chrome and glass décor and reflect the silver tone and blue based lighting schemes as well. 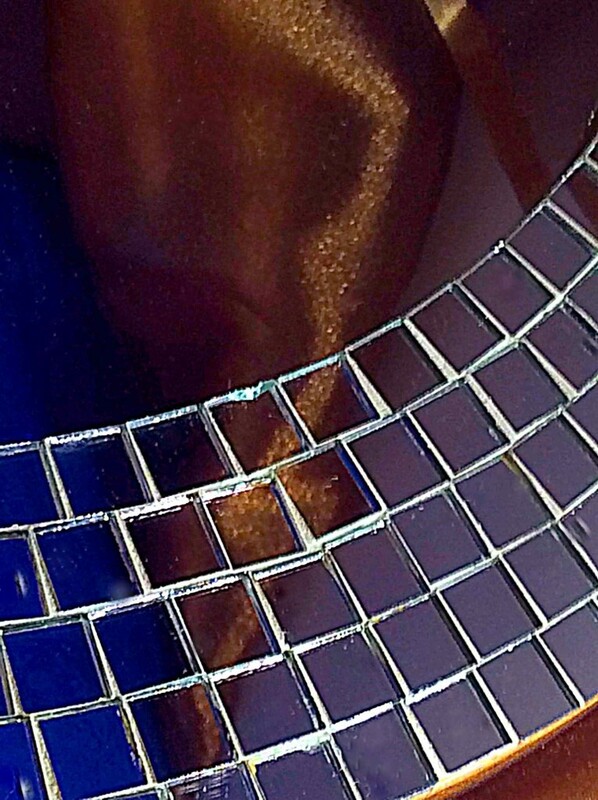 It is a heavy mirror and a well-made one. 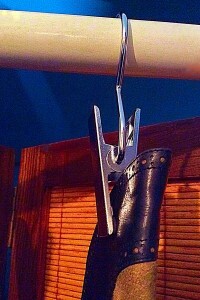 There is a generous-sized deep keyhole-like notch to hang the mirror on a nail or screw-bolt. There is hardware on the back to hold the mirror similar to the bracketing on older or well-made painting frames. It is sturdy. This mirror is shipped and packed exceptionally well in inner and outer boxes, sort of sandwiched between cardboard dowels and layers of cardboard to form almost a puzzle of security over the package itself. I was happy about this because this mirror could make a good gift for someone if you don’t really know their taste, and this is sent packed well enough to ship it to them directly and be assured it arrives in one piece. Novica works with and promotes individual artisans around the world who have learned and honed their craft using local materials, such as woods, silks, stones and gemstones, precious and common metals to create handmade works of art. Novica tells a little about the artist with each piece. For example, this mirror was crafted by an artist who admires India’s Handcrafted art and enjoys working with metals and mirrors. I received this product at a discount for my unbiased review.